Comfy beds free Wi-Fi and newspapers a heated pool and a handy location a short drive from wineries and shopping are highlights at the Comfort Inn Mercer. At the two-story Comfort Inn 102 rooms come equipped with pillowtop mattresses free Wi-Fi and local calls coffeemakers and desks; some also include microwaves and mini-fridges and non-smoking rooms are available. Pick up a complimentary newspaper before work draws you to the business center. When looking to relax guests make their way to the heated indoor pool and hot tub open year-round. 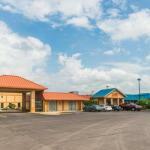 Located off I-79 and I-80 the Comfort Inn lies two miles south of central Mercer and about an hour's drive between Lake Erie and Pittsburgh. Shop till you drop at the Grove City Premium Outlets within a 15-minute drive. Wine lovers are six miles from the Volant Mill Winery. Nearby flights can be reached at Youngstown - Warren Regional Airport within 30 miles.